The 911 Vol. II The True Faces of Evil - Terror, parental guidance is suggested. It is about Good vs. Evil. There is no fantasy in this book. Some people refuse to believe the terror that actually exists, sometimes literally next door. To a terrorist, this is a way of life and they do not consider themselves to be radicals, they consider themselves as soldiers. Current examples of modern evil are the Radical Islamic Muslim Tsarnaev brothers,Tamerlan and Dzhokhar one of which became a US Citizen on 9/11/2012. 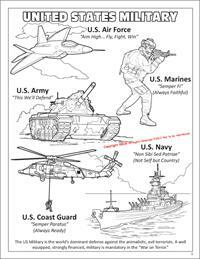 Designed as a consumer friendly, family publication for use with children and adults, this excellent graphic coloring novel helps expand understanding of the factual details and meanings in the War on Terror. 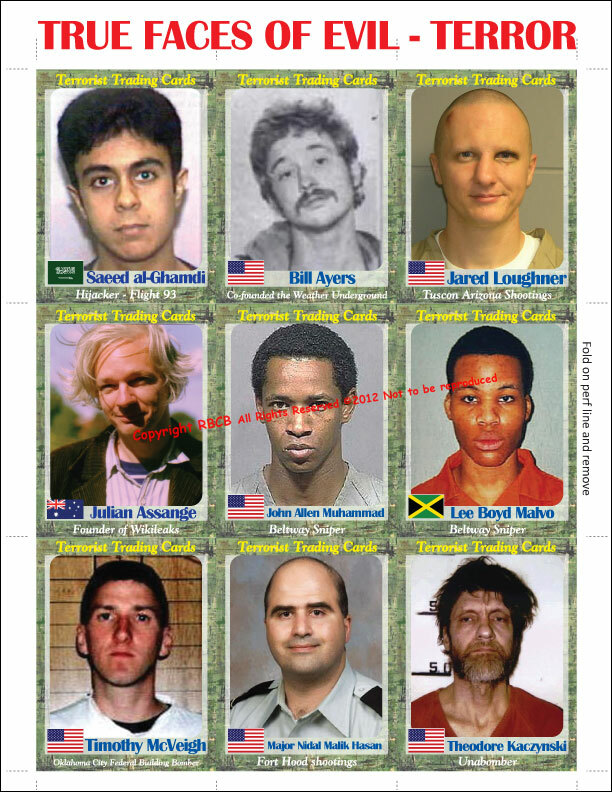 Included are detachable printed show case cards with "Faces of Global Terrorism" very similiar to the FBI's ads featuring photos of murderous terrorists and suspects. 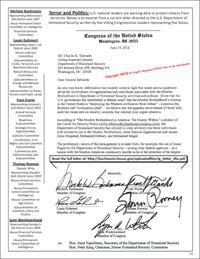 Printed just days before the Al Qaeda Benghazi Terror Groups went after and then murdered our US Ambassador Stevens and US Security Citizens in Libya. This novel that is accurate, timely and describes terror as it exists today. The Evil Terrorists defined. This is a book for adults and older children. 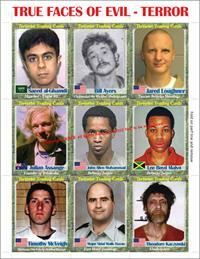 Inside this edition are several pages of perforated, removable card-stock terrorist trading cards. Inspired by real people, real life and reflecting the truth, Vol. II presents the many types of terrorism in direct open simplistic terms. The Vol. II also includes a government labeled cyber terrorist named Assange and modern day weather underground founder/leader Bill Ayers, a current educator in Chicago Illionis. 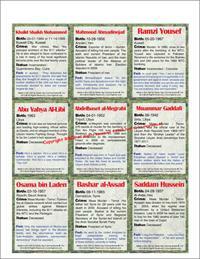 In this book you will find names, dates, numbers and locations exposing the men, women and governments behind terror as we begin to hold them accountable. 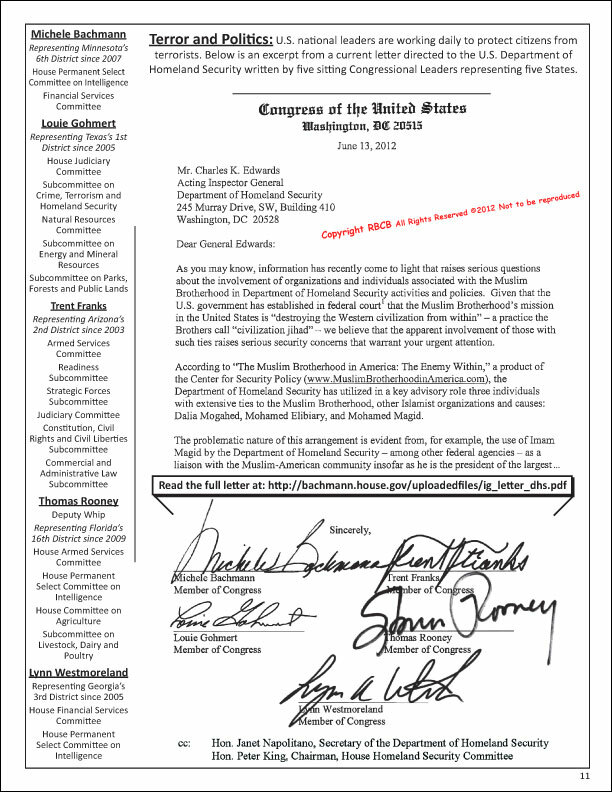 Details include a letter from within the Department of Homeland Security signed by five current Congressional Leaders a service organization page directed to the public and family friendly action notes, and The Congressional H.R. 847, the 9/11 Health & Compensation Act. 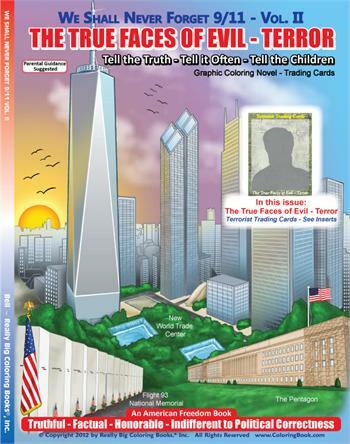 Also in the book is a recap of the original 9/11 Coloring Novel published in August 2011. 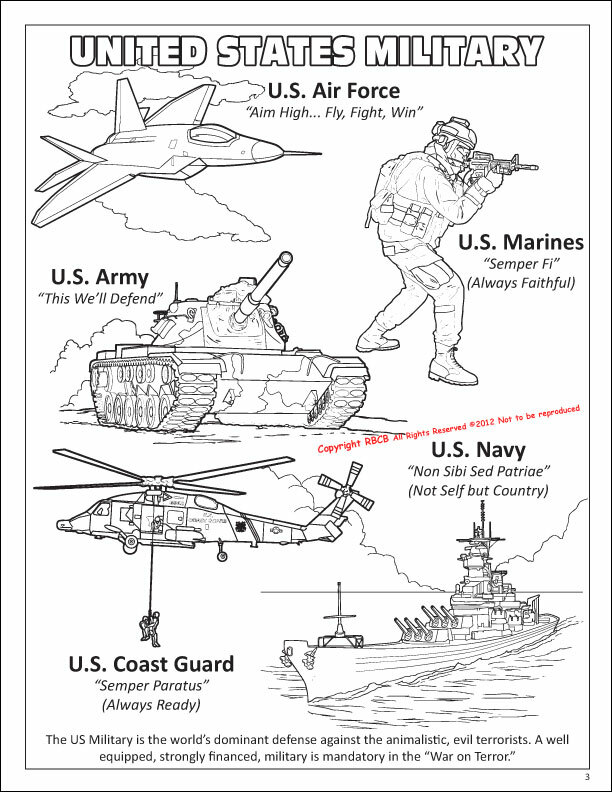 Composed with a clear message the graphic coloring book novel calls out for open and honest discussion. We educate children about something besides the "TMZ Society" which bombards them with "important" news. 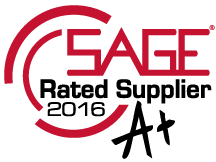 Truthful and honest education about serious subjects for youth is an essential part of learning and considered a critical step in beginning to comprehend the world in which we live. In describing the inherent bad nature of a terrorist we have included their horrific crimes. This is Good vs. Evil. 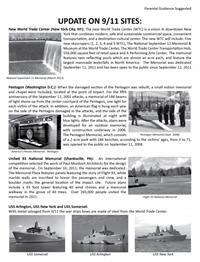 We Shall Never Forget 9/11 Vol. 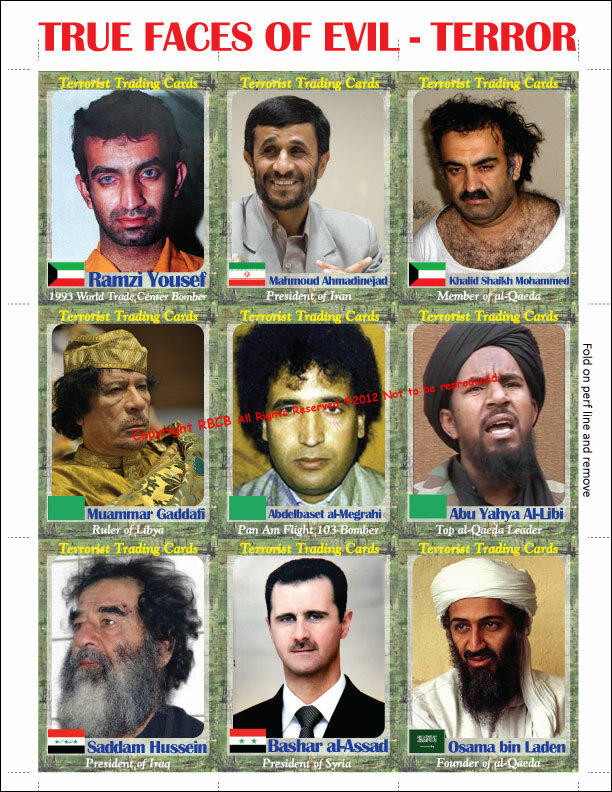 II Terrorist Trading Cards clearly identifies the evil that may sit next to you on an airplane, or it could be an avowed Atheist in the lot of your local grocer on a sunny morning.The world should look at them, make fun of them, name them - shame them, recognize who the terrorists are and rid the earth of them. 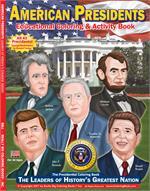 No comic book published, nor any nightmarish fiction written compares to the real absolute evil pictured in this book. And as well "They" are not finished. Imagine a terrorist with a nuclear bomb. 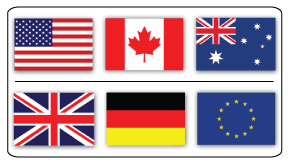 Currently we can only ship 9 books at a time on each order leaving the USA. 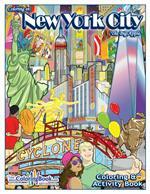 You can order as may times as you wish. 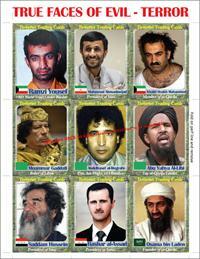 8.5" wide x 11" tall | 40 pages | Plus 8 pages removable four color gloss Card Stock Terrorist Trading Cards. “We Shall Never Forget 9/11 Vol. 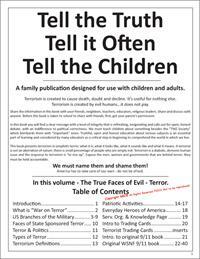 II, The True Faces of Evil – Terror,” released by the company Really Big Coloring Books, Inc., was published to give families a chance to discuss evil in the world, and claims to be “indifferent of political correctness. 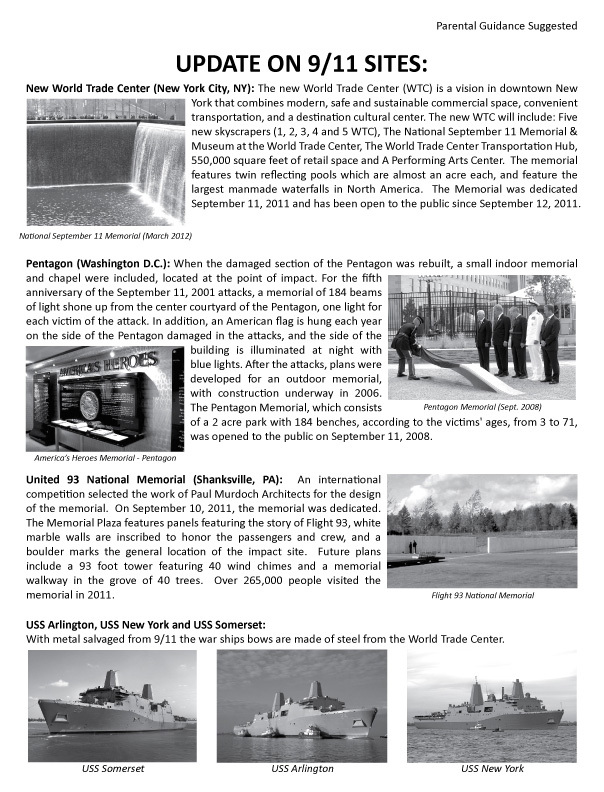 "It's called "We Shall never Forget 9/11, Volume II: The True Faces of Evil-Terror" and, among the black-and-white outlines of memorials and military men, it features collectible trading cards with photos and information about terrorists around the world." 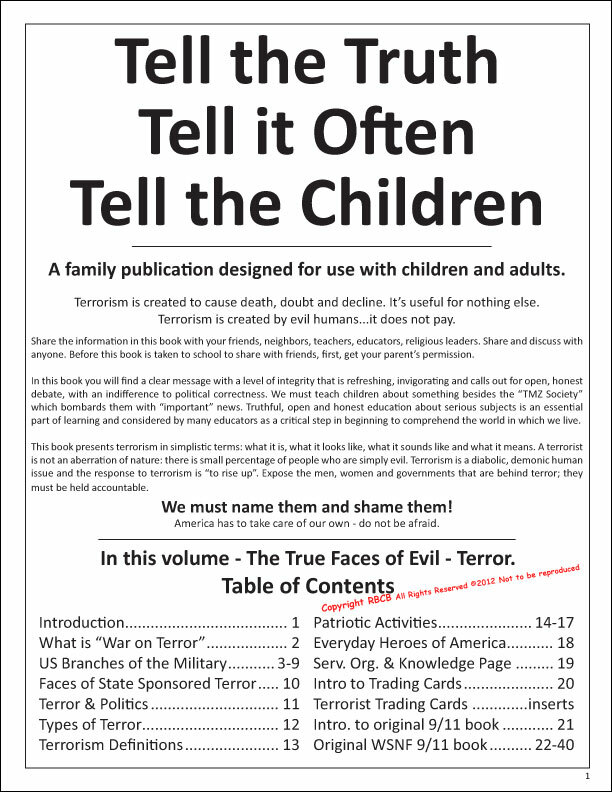 The book introduces your children to violence with images likeOsama bin Laden being assassinated and the twin towers engulfed in flames; all of which are "truthful, factual, honorable and indifferent to political correctness," the cover states. 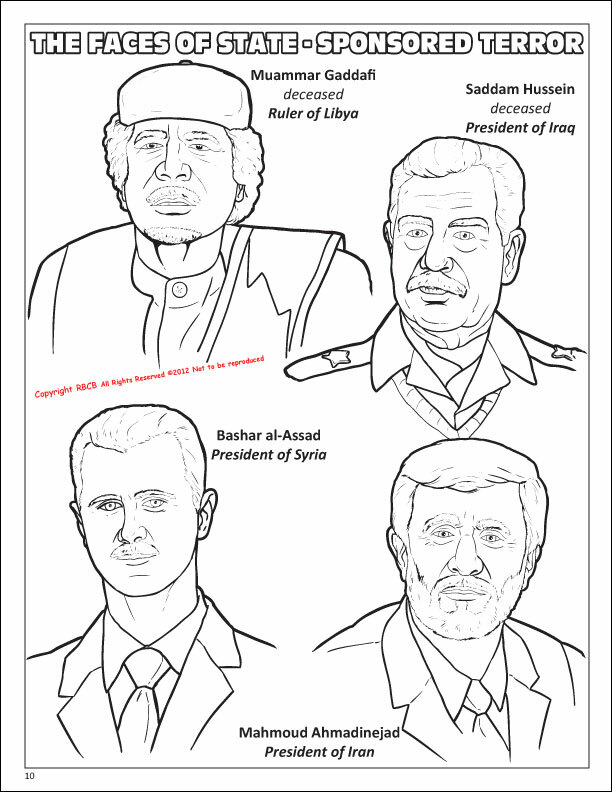 But, if your kids are not into coloring, there's another activity for them to enjoy: terrorist trading cards. 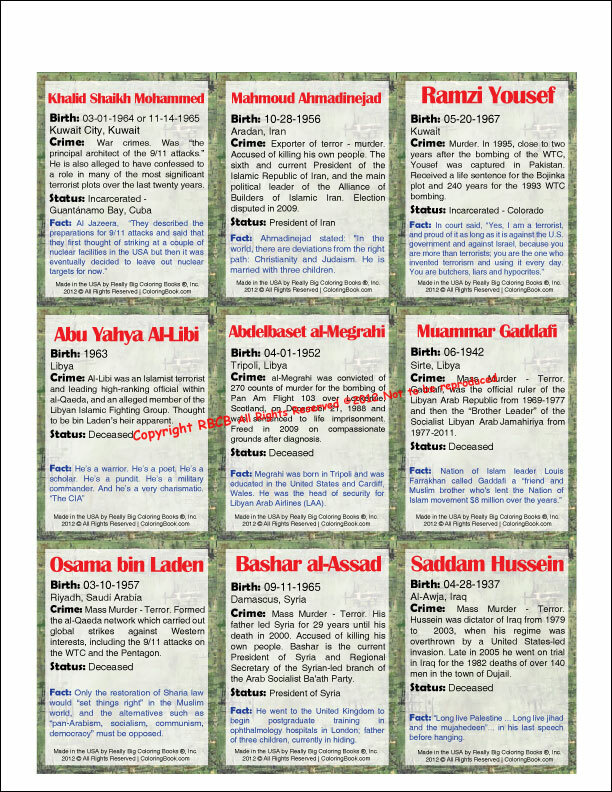 Trade your Iranian president Mahmoud Ahmadinejad for 9/11's Mohammad Atta. Collect them all! 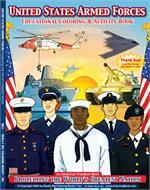 Bell says the graphic coloring novel is to help children and adults understand Sept. 11 and to shame terrorists. 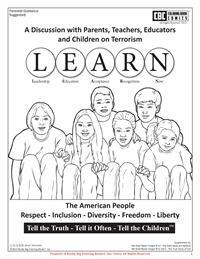 "It teaches kids and parents about terrorism. This book is about evil scum terrorist..that's what this book is about. We identify them by name, face and history..who they are and what their crime has been," he said. For me, a former retired high school teacher who is a survivor witness of such criminal terrorist attacks to our freedom, democracy, prosperity and values and also, basically, to our western culture and civilization. Your books are extraordinary. Positive effort deserves support from all decent American citizens and other free people in the world. Yes, in my personal experience, that terrible and sad Tuesday Sept. 11, 2001, morning, when I just left W.T.C. buildings, very few minutes before going to the near high school where I was teaching, coming from Jersey City, NJ, on the last path train that ended exactly in the basement of one of the twin towers. Your publications are necessary to fill another important part of my deepest and profound feelings. Thank you! The 9/11/01 horrible events impacted me directly, intellectually also, so much, even more than the thousands of crimes that Castro’s family dictatorship perpetrated for more than a half of a century in Cuba. 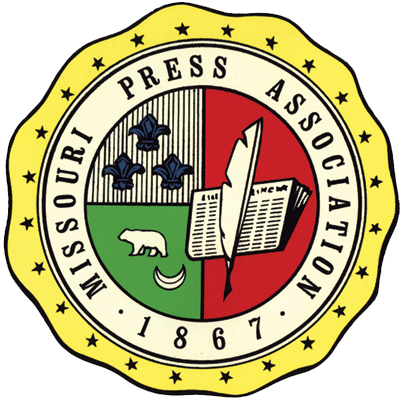 That I expect that your publications may have tremendous historical and social merits beyond all kind of materialistic considerations, I believe so. A retired senior NYC/NYS high school teacher, I live now in the south of Texas and I myself, tried to do something similar like you have done so marvelously because our next American generations and other generations from many other free and democratic nations around the world, deserve it, obviously. Thank you so much! Well somebody has got to teach the kids the truth. 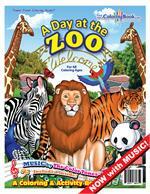 We handed out the book last year and some parents snickered about it but they all loved the book after they read it. So we are doing again this year. We do wonder how the trading cards will play. The book looks nice. To be great is to be mis-understood. This dawg got it way-heavy D.
Just received "We Shall Never Forget 9/11 - Vol. 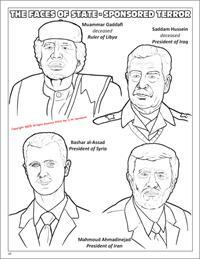 II: The True Faces of Evil - Terror Graphic Coloring Novel - Terrorist Trading Cards". Thanks. This is even better than the first issue! More of a learning experience for the kids. Best of luck with your enterprise! 9.11 Childrens Comic Book? Are you out of your fricken minds? You are in fact American Terrorist, Arent you? You dont even have the fricken correct facts. Cease and Desist. And you include Julian Assange You are obviously against Democracy? You are vile, propgandists in League with the people who planned and carried out 9.11 You are completely transparent and We All See It! Dont be fooled. We're watching you. American be doomed and damned. ASSANGE IS RIGHT!